Our friend and Past Chancellor of The Justinian Society, Nicholas J. Lisi, has passed away. "Nicholas J. Lisi, 68 of Wayne, PA, died on Saturday at the Memorial Sloan-Kettering Cancer Center in New York, after a long and courageous battle. 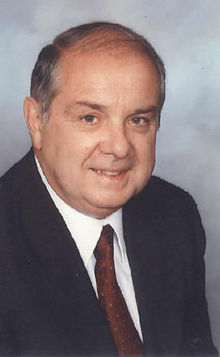 Mr. Lisi, an attorney in Philadelphia with the firm of Padova & Lisi, was born in Vineland, NJ. He earned his bachelor's degree at LaSalle University in 1962, and his law degree from Boston College Law School in 1965. Following law school, Mr. Lisi was an Assistant Public Defender for the State of New Jersey and a partner in a litigation practice in Millville, NJ, until he moved his practice to Philadelphia. An active trial lawyer, Mr. Lisi was a member of the American Trial Lawyers Association, the Pennsylvania Trial Lawyers Association and the Philadelphia Trial Lawyers Association. He was a member of the National Italian American Bar Association, as well as the Justinian Society, an organization for Italian American lawyers, where he served on the Board of Governors from 1984 until 2009, and as Chancellor from 1992-1994. Mr. Lisi was also involved in the Philadelphia Bar Association, serving on its Board of Governors from 1995 to 1997 and was also a two-term member of the Philadelphia Judicial Selection and Retention Commission, which he chaired in 2001. In addition to his involvement to the legal community, Mr. Lisi was also a very active alumnus of both LaSalle University and Boston College. He served on LaSalle's Board of Trustees from 2002 through 2007. He was involved in the LaSalle University Alumni Association, and served as President from 1997 to 1999. While at LaSalle, Mr. Lisi was a founding member of Sigma Phi Lambda fraternity and remained an active alumnus of the fraternity. In recognition of his outstanding service to the University and the Alumni Association, he was named as the recipient of the LaSalle University Alumni Association John J. Finley Award in 2002. Mr. Lisi was a delegate to the Boston College Law School Alumni Association. He was also a founding member and the first President of the Philadelphia Area Chapter of the Alumni Association. He received a Distinguished Alumni Award as part of Boston College Law School's 75th Anniversary celebration. Mr. Lisi enjoyed spending time with his grandchildren, working in his garden, collecting model trains and spending time at the Jersey Shore. He was an avid baseball fan, having attended Game One of the 1980 World Series and Game Three of the 2008 World Series, both won by his (usually) beloved Phillies. He enjoyed the game on many levels and was also a Little League coach for several years. Mr. Lisi is survived by his wife of 43 years, Marie Elena (nee Santoro) Lisi; his daughter, Kristin Lisi Conway and her husband, Craig; his son, Michael D. Lisi and his wife, Kerith; his son, Mark A. Lisi and his wife, Tracy; his six adoring grandchildren; Ryan, Andrew, Alexandra, Luke, Madeline and Joshua; his sister, Rose Marie Parenti and her husband, James; his brother Joseph Lisi and his wife, Rosemary and his sister-in-law, Ellen Lisi. He was predeceased by his brother, John Lisi." Wednesday, July 15, 2009: 6:00 p.m. to 8:00 p.m. viewing at D'Anjolell's Memorial Home, 2811 West Chester Pike, Broomall, Pa.
Thursday, July 16, 2009: 8:30 a.m. viewing at D'Anjolell's Memorial Home; 10:00 a.m. Funeral Mass at St. John Neumann's Church, 380 Highland Avenue, Bryn Mawr, Pa. In lieu of flowers, the family asks that donations be made in Mr. Lisi's memory to support the work of the Memorial Sloan-Kettering Cancer Center, which provided Mr. Lisi with outstanding support, care and hope. Donations may be sent to P.O. Box 27106, New York, NY 10087 or made online at www.mskcc.org. The Justinian Society has also created a scholarship in Nick's name to be managed by The Justinian Foundation. Donations to the "Nicholas J. Lisi Justinian Foundation Scholarship" can be made to: The Justinian Foundation, C/O Gaetan J. Alfano, Justinian Foundation Treasurer, Pietragallo Gordon Alfano Bosick & Raspanti, LLP, 1818 Market Street, Suite 3402, Philadelphia, PA 19103. Checks should be made payable to The Justinian Foundation noting the scholarship name in the memo.